Cake is as synonymous with birthdays as parties, presents and singing. 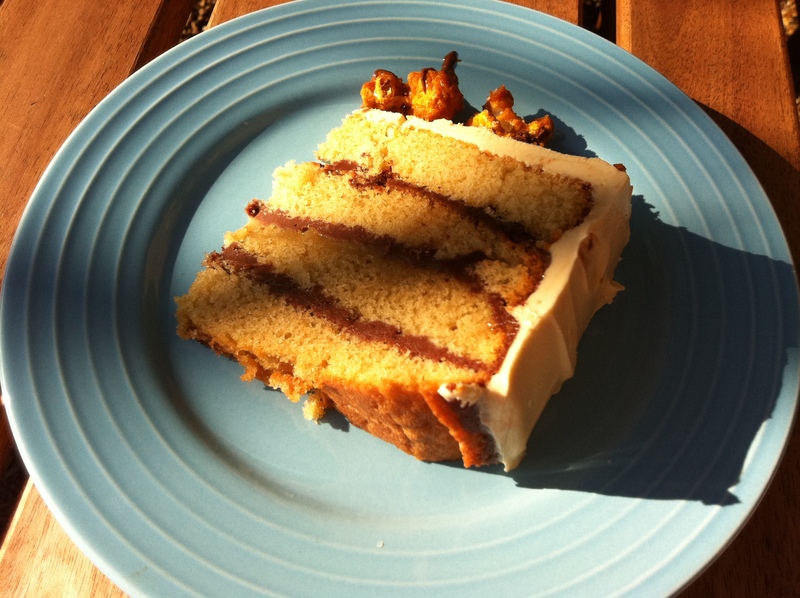 That’s not to say it doesn’t serve a purpose at other occasions or celebrations – anyone who reads this blog will know I’m a strong supporter of cake consumption on a pretty much regular basis – but very little can compete with a cake baked specially for a birthday. Whether it’s a simple sponge cake or a more extravagant affair, there’s something incredibly indulgent about a confection created especially for you. However, while cakes can be beautiful, delicious and a joy to eat, it’s sometimes hard to recreate the utterly magical birthday feeling you get as a child, that sensation of complete surprise and delight. When deciding what to make for a friend’s birthday last week, I wanted to inject just a little bit of that childhood magic back into my baking. A lovingly made cake is a good start, but I needed something to make it extra special. Popping candy has the extraordinary ability to turn sensible adults into excitable kids in a matter of moments. It’s the edible equivalent of helium, an unusual, transitory pleasure that never fails to bring a smile to the faces of even the most majestic and mature amongst us. Releasing carbon dioxide on contact with your mouth, it sizzles, pops, whizzes and bubbles, tickling your taste buds before fizzling out in a final crackle. Taking my cue from the master of magic and big kid himself, Roald Dahl (the quote above is from The Minpins, for those who want to know), I disguised my little bit of fizzy fun, hiding it within the layers of a sticky-sweet toffee cake. A simple chocolate ganache is swirled with chocolate covered popping candy and used to sandwich the sponge together, while further shards of crackling crunch hide amongst the chewy chunks of toffee popcorn embedded in the buttercream on top. It’s not a hugely practical cake – the cream in the ganache means you should really store it in the fridge, while the toffee popcorn will only retain its chewy crunch if kept at room temperature – but it’s fun. In fact I think this fleeting period of perfection when the cake has just been made is what it’s all about; an excuse to indulge in your most childish instincts, enjoy the moment and eat it all at once. In great big slabs. With a great big smile on your face. Because cake should be fun, because birthdays should be better, and because you’re eating a popcorn cake. . .that actually pops. What magical moments do you remember from childhood? And what other desserts do you think would benefit from a bit of added ‘pop’?! 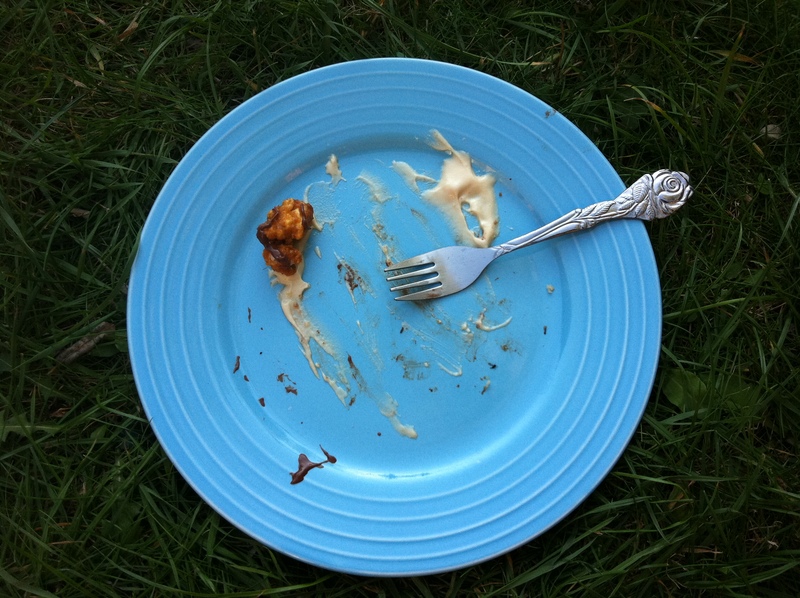 A pretty clean plate . . .& how adorable are my friend’s little cake forks? Grease and line two 20cm and one 15cm pan. Preheat the oven to 180 degrees C.
Sift the flour and baking powder into an electric mixer. Add the butter, eggs, sugars and vanilla and beat until well blended, without overmixing. Divide between the three tins to equal depth then bake for 20-25 mins, or until a skewer emerges clean. Remove from the oven, leave to cool slightly, then turn onto a wire rack to cool completely. Once cooled, slice the two 20cm cakes in half horizontally to make four rounds. You won’t need to use the 15cm cake in this recipe, so freeze for use at a later date. Melt 150g of the chocolate, cream and butter in a bain marie. Stir until smooth then set aside to cool and thicken slightly. In the meantime, melt the remaining 100g of chocolate. Allow to cool slightly then stir in the popping candy. Stir the chocolate with ‘pop’ into your cooled ganache. Place one of the four sponge cake halves on a cake board or serving plate, securing it with a little splogde of ganache. Smear ganache over this first layer, then repeat with the following three layers, topping the cake with a flat, un-iced sponge, good side up. Pop in the fridge to firm up while you make the toffee buttercream. Simmer 80g of the butter, the brown sugar and syrup over a low heat in a pan until it is a deep caramel colour. Remove from the heat and add the cream and vanilla extract, stirring to incorporate. Allow to cool to a thick toffee. Meanwhile beat the remaining butter in an electric mixer until light and fluffy. Add the icing sugar and beat until creamy – this should take several minutes. Finally add the cooled toffee and beat in well. Melt the chocolate. Allow to cool slightly then stir in the popping candy. Spread over a piece of baking parchment and pop in the fridge to cool until set. Preheat the oven to 150 degrees C. Heat the oil in a large pan then drop in the corn kernels, pop the lid on and shake the pan until all your popcorn has popped. Remove from the heat. Melt together the sugar, butter and syrup over a medium heat. Bring to the boil then continue stirring for a few minutes more. Remove from the heat and stir in the bicarbonate of soda and vanilla extract. Pour over the popcorn and stir gently to coat, then lay the pieces flat on a tray and bake for around 10 minutes, stirring once in this time to ensure it cooks evenly. Remove from the oven and allow to cool. Slather the toffee buttercream over the cake, ensuring it is equally distributed over top and sides with a smooth finish. Remove your chocolate with ‘pop’ from the fridge and crush into fine shards. 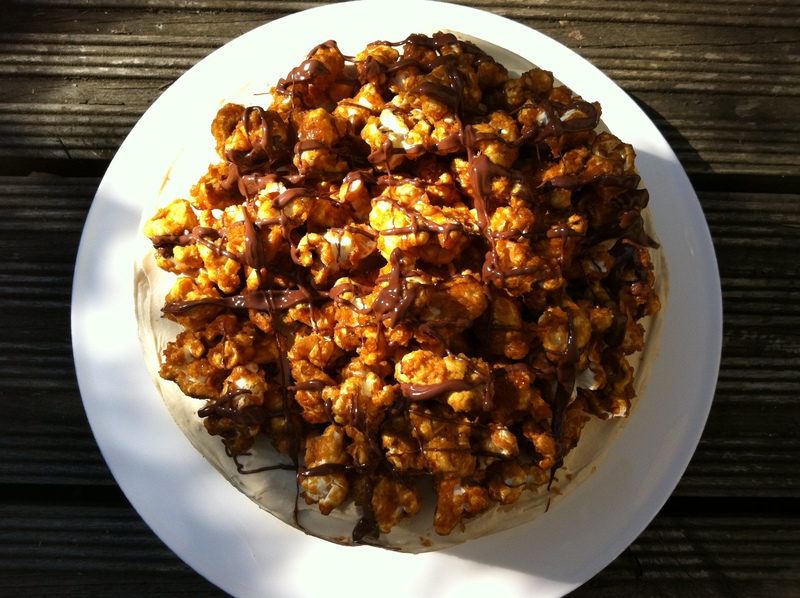 Scatter a few shards over the cake, then push pieces of cooled, crunchy toffee popcorn into the icing on top. Scatter the remaining shards of candy over the popcorn, then drizzle the whole thing with melted chocolate. n.b. the popcorn will go a little chewy if you leave it in the fridge, so try to assemble the cake fairly soon before eating. Oh my lord, what a delicious idea. I’ve always found shop bought toffee popcorn to be a little too much, but I think I could handle plenty of this – especially since home made popcorn is simply the best! Wow, toffee, popcorn AND cake. Best recipe EVER! superb! I have used popping candy a bit too. Such fun. This is a gorgeous idea. Really well done! Wow this looks SO delicious! The popcorn topping looks fantastic!!! Bestest birthday cake EVER! (and sorry Mum, that does include the ‘swimming pool’ cake you made me for my 8th birthday, consisting of chocolate fingers, green jelly and slightly grubby playmobile people). Cook Bake Eat Love – I’ve always been a chocolate cake kind of a girl, but this toffee sponge is a serious contender for my affections now! Not Quite Nigella – thanks! Rosie – aw, thanks lovely. I can’t quite believe it beats a Mummy Hooper swimming pool special though…that sounds absolutely epic! What a fantastic looking cake! I love the idea of popcorn and popping candy – just genius and I don’t think I’d have any trouble polishing most of it off before storage became an issue! It is amazing. Everything is better with popping candy, especially hidden popping candy that has the surprise element. Wow, just beautiful! Never thought of putting popcorn on a cake before and all the layering just looks beautiful! London Bakes – I took a little doggy bag of cake home from my friend’s house but it only lasted about 10 minutes once I’d walked in the door! 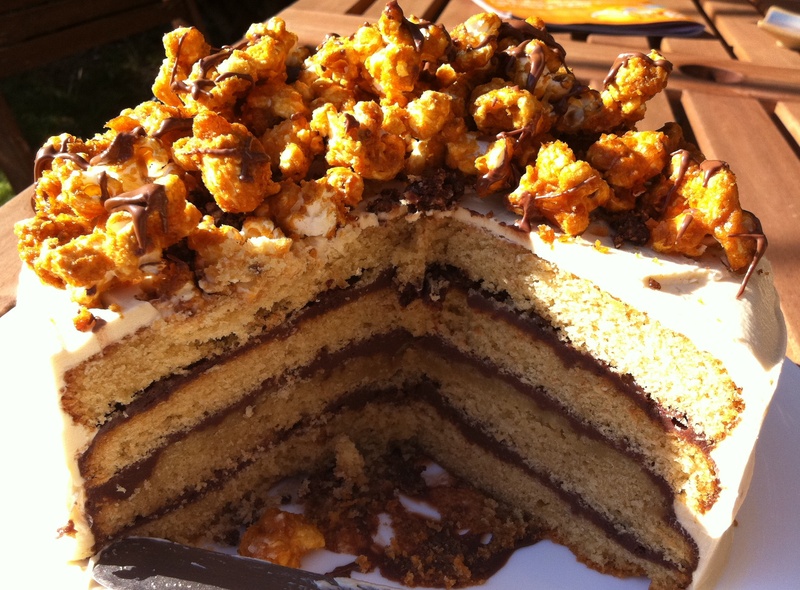 First you give us a snickers dessert and then you give us toffee popcorn cake – you are spoiling us Little Loaf really you are. Delicious. Birthday cakes should be special – you are such a nice friend! I made a rainbow cake (7 different color sponges – covered in white butter icing for my 3yr olds birthday – their little faces when we cut into the cake was worth all the effort! I’m planning a gingerbread house village square for the 5yr old with the christmas birthday. I love birthday cakes! I WANT TO EAT THIS. Love love LOVE all the toffee and crunch. How fun! Warm Snug Fat – I’m always so impressed by rainbow cakes…I’ve never made one but really want to try soon! the next time i make popcorn, i will definitely make some with your toffee and chocolate recipe! This recipe is so much fun! Just looking at all the elements puts a smile on my face. Also, I LOVE Roald Dahl. What brilliant fun – I would have so loved this as a child, I would so love it now. Chocolate and toffee and popcorn that pops. I’m not sure there’s much more to add. Absolutely fabulous! Super inventive and looks decadent. Love all the textures you have going on in the one cake. If anything, I enjoy popping candy more now in my late thirties than I did as a child – wonderful stuff! Love the idea of mixing it into popcorn…more pop than your usual corn, for sure! Fleur du Poirier – definitely try the popcorn, it’s delicious on its own as well as on the cake! Choclette – it’s pretty hard to beat popcorn that really pops! Wandering Spice – thank you. The chocolate ganache in addition to the toffee buttercream is slight sugar overkill but I like the different textures and flavours! The Caked Crusader – popping candy is ace, and just as much fun for big kids! What a fab idea, I’m sure your friend was very flattered by your thought. What fun! This looks like such a fun cake to make and eat! Brilliant idea. I am sooo curious on the toffee sponge cake. Your layers look just perfect. I love that there are pop rocks in this cake. Did they lose their pop after a bit of time or did they actually hold up? I’ve wanted to try something like this for awhile and I’m curious. Also, toffee and popcorn is pretty much my favorite. Kristin – the whole cake got eaten within 24 hours of icing it! The popping candy lasted that long, but not sure if it would survive much longer… I guess as long as it doesn’t get wet it should do. Kristen – popping candy really does make you feel like a big kid, love it! I think I may have just found my husband’s next birthday cake!